I have purposely avoided posting my daily running schedule and other insignificant details of my day to day life on this blog. I don't want to bore away my readers so I have tried to keep it mainly about reports and upcoming events and the thoughts that may come to mind as I experience these events in my life. What I hope to do with this posting is to give some ideas to basically two groups of runners out there. Those of you that have never finished a 100 and those that may have finished a 100 but had a miserable experience with throwing up and /or walking the last 30-40 miles. If you have successfully finished a 100 and in decent shape then congratulations. There is probably nothing here to benefit you. You may even be able to give me a few pointers on getting faster. ( I already know two big ones. Train more and get younger). I do not pretend to be any great guru, coach or exceptionally smart or gifted runner.I'm just an average ultrarunner with now 10 years of experience. I started off in the bottom 1/4 of finishers and in most races even now find my way in the middle of the pack although more towards the top 50% now. However I have had a little more success at the few 100's I've done. Scott Brockmeirer told me after having such a successful first one that maybe that's where I would discover my talent. I think it is probably true that some of us may be genetically more inclined towards the longer distances than others. But I also believe that my limited success is that I know myself very well and have the ability to monitor my condition and stay within my limits combined with an ability to make a plan and stick with it. If you have never attempted a 100 then my advice is don't. Are you crazy? Have you lost your mind completely? Are you some kind of idiot? If you can answer yes to all three of these questions then perhaps you are ready for a 100 mile race and will learn something from this. My first word of advice to you is this. If you have only been running a year or two and think it would be cool to run 100 then don't . Not yet. There will be plenty of time to run a 100 later. First take several years to learn to run well at shorter distances. Study the great coaches and runners. Learn to do intervals and tempo runs. Become an efficient and stronger runner first. You will avoid more injuries and enjoy the long races more. Ok, now for the rest of you that have tried and failed or suffered like dogs. Training: Obviously the more miles you can run, the better you will be at this sport. But all of us are not gifted like Ray the K and others that can pile on 150 mile weeks. Most of us struggle with a 3rd of those miles. The good thing is that although more miles makes it easier, you can get by with a lot less. I ran my first 100 with only 29 miles a week average over the 6 months prior to the race. I had run my first 50 the 6 months before off of 25 miles a week. In between I ran 3 50k's and a marathon. They were my only long runs other than a couple of 17 milers. Since then I have bumped my mileage up to about 45 miles a week for the past two years. It has helped my times and my recovery but I have never felt any better than in that first one. ( this was original written 5 years ago. 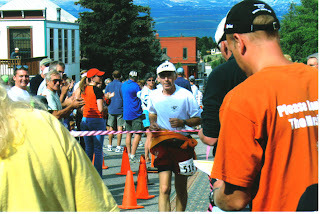 Since then i have maintained close to 50 mpw with occasionally more and just finished the Tahoe rim 100 July 2011 and felt GREAT.) So what does that mean? Don't overtrain yourself. Most of us average folks will do better on less miles. You will be less likely to be injured and when race day comes you will have fresher legs. You can get by doing an ultra race or training run a few weeks before a 50 but you need to be more conservative for a 100. Yes, some people can run back to back 100's. Remember, I'm not talking to them, I'm talking to you who have tried and failed. It's not more miles or longer training runs you need, it's a better taper. Many folks advocate doing back to back long runs on weekends. Again this may work for some folks, but most of us would do better resting and recuperating. Unless you are a 100 mile a week runner and I'm not talking to you anyway, a training run over 40 miles is going to be counter -productive. My longest leading up to a 100 that wasn't running a 50k race is 25 miles. I may do a 35 miler a month before my next 100 but I also plan to taper for a full month. It is very important to train the way you plan to race. That means walking on not just your long runs but even on some shorter ones during the week. You will likely be walking a lot in the race and you need to learn to walk well. Nutrition: I've read thousands of articles from experts on nutrition over the past 34 years and have found a way to ignore most their advice. According to the experts, the diet I eat shouldn't allow me to be alive at 55 let alone run 100 miles. But again, we are all different genetically so what works for me probably isn't good for you. So what I'm saying is as long as you keep the body fueled and are within your normal weight range, there is no magic diet going to get you through a 100. If you are getting enough energy to get you through your workouts then stick with what works. If not, then experiment until you do. During the race you will again have to do what works for you. But during the race is not the time to be experimenting. You should be practicing what you eat in your training. Some folks do fine on solid food, others do better on liquids and gels. I tend to do my best on the gels, liquids and candy with maybe some chips and crackers and cookies. If you do eat solid food then you should plan on walking longer to let digestion get going. Otherwise when you start running that food is going to sit there. Then you eat some more and guess what. Eventually it's got to go somewhere and if you keep stuffing food in there and not letting it digest then you barf. I have never thrown up in an ultra although a few times I wished I would. Stop eating until your stomach gets happy. You will live and you can keep moving although maybe slower than you would like. I once went 30 miles in the middle of a 100 without eating anything. You can survive off body fat. Just don't make a habit of it. A lot of you like to take a lot of salt capsules and even use them in training. Sodium is very important obviously but I think a lot of folks use way too much. If you are training with them then you are not allowing your body to learn to naturally retain and keep your sodium levels even. You might as well be eating a high salt diet. Being old school long time runner that I am, I never used any salt additives for the first 25 years of running and somehow never died. Of course I wasn't running ultra's then but even today it doesn't take much. Yes, at times I do take a few caps, especially in hot weather but I would never take them at specific time or mile intervals. It only takes a few minutes to correct a sodium shortage but can take hours to undo and over dosage which will contribute to the nausea you may have felt as your body tries to find equilibrium. I think the most E-caps I have taken in a 100 is about 4 or 5 and they are very low in sodium content compared to most other supplements. If you aren't over-drinking you will be much better off. Instead monitor your body and only take sodium supplements as needed. I know I need some when my stomach gets a little sloshy because fluids aren't absorbing. Other times if I start to get a little spacey then a little salt will fix it. Sometimes it's hard to tell the difference between the wooziness from sodium depletion and low blood sugar but you can usually tell by your energy level. Mental Preparation: If you have attempted a 100 then you are already mental but there is still hope for you. 100 miles is a long way to go and it's hard to get a grasp on the distance so don't even try. You just have to forget about your normal perception of time and distance and accept that you are going to be running a very long time. Live in the moment and don't think about how far you've been or how far you have to go. Just keep moving. In my training before each 100 I visualize myself in the race feeling good. And I always see myself finishing successfully. Then on race day I just have to make the vision a reality. I think that's all. I hope maybe this has given you something to think about and will be of help to you. I really like to see others succeed and reach their goals and dreams. Feel free to ask questions or call me a clueless idiot. 100 miles is impressive. Anyone who completes that is to be commended. Good post. I think your point about going out too fast is very important. Hopefully I will remember that at Massanutten next month. Good nutrition and pacing advice. The training stuff... if it works for you, fantastic. I can't imagine trying it that way though. ...not just for the physical benefit of higher mileage, but just from the uncertainty I'd have on the starting line. But whatever works for you. Good post! A few years later . . . I'm reading this and taking it to heart. I failed on my first 100 mile attempt. But I'm going to do this one! Thanks for the instruction!